Dr. Dre's legacy is well documented, with three excellent albums and a countless collection of bangers in his repertoire. Yet one of his often underappreciated skills, which tends to soar under the layman's radar, is his proficiency as an engineer. In fact, a clip from the Defiant Ones found a young Jimmy Iovine marveling at Dre's mixing on The Chronic demos. Since then, his skillset has only multiplied, and Dre's perfectionist ear has helped pioneer his pristine signature sound. No doubt, many artists could benefit from having the good Doctor behind the boards. As it were, Anderson .Paak has managed to land exactly that. After a saucy Dre let the album's title slip on Instagram Live (Oxnard Ventura), many were left expecting the project to arrive later this year. Now, it appears such is indeed reality. Head A&R at Aftermath Entertainment, Ty Cannon, threw up a picture on IG, showcasing a honed-in Dre posted behind the boards. The caption confirms that Dre is indeed working on .Paak's album. 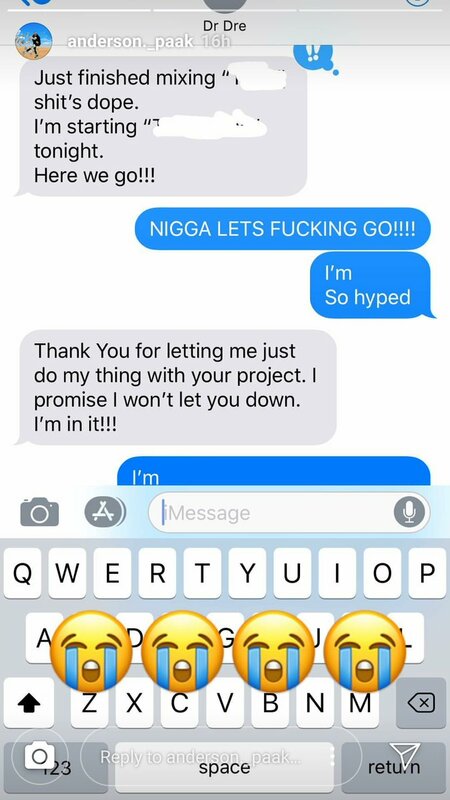 To add even more hype, Onsmash shared a screencap reportedly posted by .Paak himself, revealing an iMessage exchange between him and Dre. "Thank you for letting me do my thing with your project," writes Dre. "I promise I won't let you down. I'm in it!!!" writes Dre. Gotta love it.